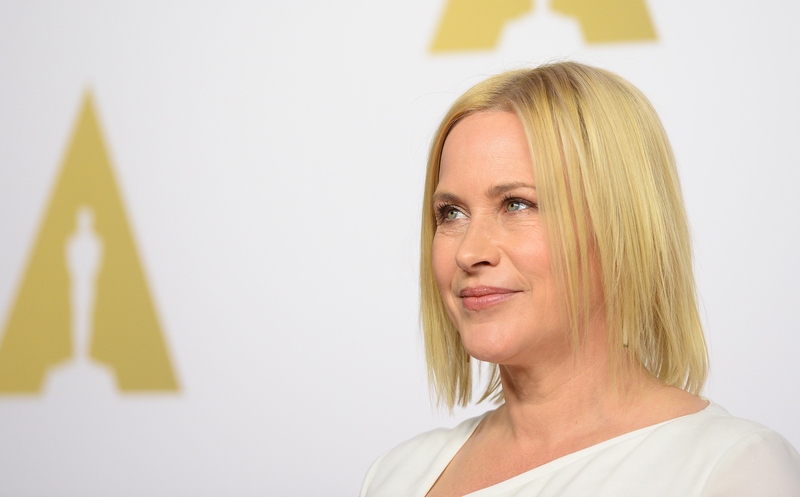 Patricia Arquette made headlines a few weeks ago not only for winning an Oscar, but also for her acceptance speech in which she called for wage equality for women in America. While she used her platform to help advance a good feminist cause, she was (understandably) called out for excluding gay people and people of color when she spoke again about the pay gap in a press conference following the award show. In case you need a refresher, Arquette said, "It's time for all the women in America and all the men who love women and all the gay people and all the people of color that we've fought for to fight for us now." Yikes. Considering the fact that the gay population and minority population both include women, it is not surprising that she received some criticism at the time. But now, in a follow-up interview about wage inequality, Patricia Arquette specifically discussed the plight of women of color in regard to the wage gap. During an appearance on The Late Show With David Letterman, Arquette dropped some troubling statistics concerning gender wage inequality in America and the women who are affected by this injustice. But unlike her speech at the Oscars, this time Arquette seamlessly added information about minority women into her discussion. Arquette said, "It's 55 cents for a Latino woman to a dollar. That's 45 cents on every dollar that woman is not making. It's 56 cents for an African American woman. That's almost half of her money." Though some may overlook these statistics she provided, it's extremely important that she added them in. It shows that not only is Arquette paying attention to wage gaps of different demographic groups, she is also willing and ready to raise awareness of these issues. It's a great step forward in a celebrity showing solidarity with groups she is not a part of. But there are still some more steps to take, of course. After she was criticized for seemingly brushing over individuals with intersectional identities, it is great that Arquette has opened up for more conversation about the wage gap for people not directly part of her demographic group (and certainly not her socioeconomic group). Now, in order to continue raising awareness to make a change, it's important that she keeps bringing up the groups' experiences. After all, her fans are probably inundated with so many statistics every day. In a digital age where so many stats are available, it's easy to hear a troubling number and say, "That sounds awful," and then forget about it a few minutes later. Expanding on the numbers as they relate to real-life humans and putting a face on the issues are what will make people care and make them want to enact change. Also, it is important for her to continue to address the wage gap for women who are part of the LGBTQ community. Though she said she has been an advocate of that community, it is also important that she ties the group into her discussion about money. Though hard statistics may not be as easily accessible, she can still use her advocacy to include them through stories about some individuals' experiences. It may be easy for her to go on the defensive when she has been criticized for her speech, but the route she seems to be taking on Letterman appears to be a much better and more inclusionary path to take. Let's hope that she continues this theme. Check out her interview below and see what you think!